Coffee and Fellowship: Each service followed by refreshments. All are welcome to join us. Healing Prayers: If you desire the prayers for the healing of body, mind, or spirit, please stay by the altar-rail after receiving communion or a blessing. For directions to the churches, click here. 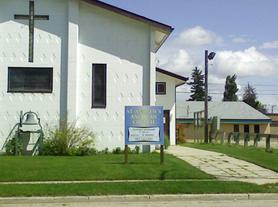 St. Bride's Anglican Church in Watson. Photo taken at 7:00am on March 1, 2018. Although St. Andrew's does not have services every day, many Christians pray and read Scripture daily. One of the resources we use to help guide our daily reading of Scripture is called The Revised Common Lectionary. The Lectionary is like a three-year bible study; it guides us through a structured reading of Scripture. Click here to use The Lectionary.